Everybody was born with a pair of hands. 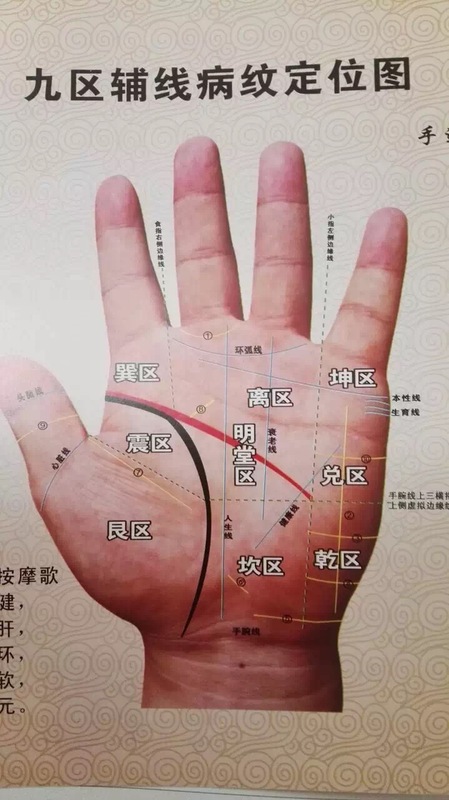 It carries your congenital information into this world.Palm reading is based on fractal and holographic imaging theory, where are small part can reflect the larger whole. 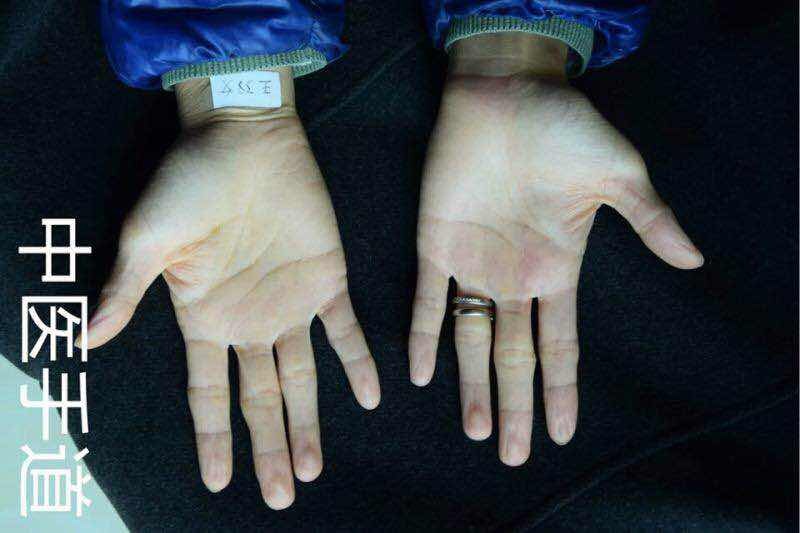 Have you ever thought why is your hand is thin or thick? why your hand has so many lines? why your hand is green color or red color or white color...? As you grow up, it will change shape, lines will be added to your palm according to your personality, your living environment, your life style, your job, your life experiences. By reading these lines we can predict all your health conditions in the future according to your present state. Palm reading is an ancient method to diagnose someones health condition, as all the internal organs are reflected inside the palm. Come to our clinic, we will offer you a free palm reading session. Below is an explanation of the geographical landmarks and how they can be interpreted to reflect this persons health condition. Hand Type: Wood Fire Element constitution. There is a clear distinction between love and hate in this person and presently they hold both emotions in their heart at the same time. 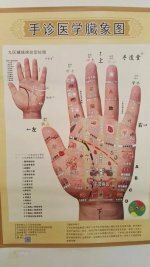 Dry wrinkled fingers, and thin the the middle with knots indicates deficiency of the 5 Zang. She is easily leading to Liver Qi stagnation, with Liver invading Stomach. So this person is susceptible to liver, gall bladder and digestive ailments. 1) Zhen Area: sunken and wrinkled. Deficient stomach Qi. Endocrine hormones are not enough and there is disharmony between stomach and Kidney. 2) Xun Area: Liver and gall bladder has irregular functions according to the irregular emotions. Toxin is accumulated in the liver and while bile is not excreting enough. She needs to regulate her emotions, trying to keep herself as calm as possible, not to get angry as often. 3) Li Area: She has chronic inflammation in the pharynx and larynx. She is also in a tensed and stressed mind state, overused the mind, easy to have neurasthenia. Blood toxin is highly accumulated. Weak bronchial system. 4) Kun Area: It indicates reduced functionality of the spleen and kidney. 5) Dui Area: Her intestines are hypo functioning. Obstinate line exists. 6) Qian Area: Lung function is not as good as before. Her endocrine function starts to decrease . 7) Kan Area: Her lower back pain comes and goes. Uterus is cold. She also has uterus trauma. It also shows hemorrhoid. 8) Gen Area: Small intestines is not digesting and absorbing food very well, easily cause malnutrition . Superficial gastritis possibly exists . 9) Ming Tang Area: She has low blood circulation in heart and brain. She is easy to have neurasthenia.She needs to improve aerobic exercises. 1) Life Lines: She has low immune system. Neck and lower back pain comes and goes. She has trauma in fertility area. 2) Wisdom Lines:She is easily distracted, nervous. Her heart doesn't have enough blood supply. 3) Emotion Lines: It indicates trauma in fertility. She has lower back pain. She also has potential diabetes. 1) Career Lines exists means career focused. One of it parallel with life line means her job is related to health. 2) Health line is thin and long. She is in sub-health state. 3) Liver and gall bladder line indicate unstable emotions, causing malfunction of liver and gall bladder.